I love doing projects with my husband...and our latest project has got me driving behind stores searching for pallets. We made a ottoman for our front entry/piano room for $27.00 total cost using a sturdy thrown away pallet, recycled furniture legs, some old couch cushions and a sleeping pad! We found a 3' x 3' pallet that was in great shape and a steal of a deal on the legs at our local Re-Store. The Re-Store is a place where old construction or furniture pieces are gifted to support Habitat for Humanity. I found the legs for a buck each! We began by drilling lead holes into the pallet and screwing in the legs. I still can't believe I found them for a buck! Check with your local Habitat for Humanity to see if they have a recycle store where you can find your goodies! Screw in or attach the legs to the bottom of the pallet. Next, we took some old couch cushions we use when camping for the padding. You can buy the foam at a local Joann's or an upholstery supply shop...but for this project, I wanted to recycle everything I could and these cushions were perfect. To hide the seams of the cushions, I covered it with a large "egg carton" mattress pad that I had in my camping supplies. This added another inch of padding and hid the seams, making the top smooth. The only "new" items that I used on this project were the upholstery tacks and the fabric. I found the perfect fabric at a discount decorator fabric store for $3.00 a yard. It took three yards to cover our pallet. We laid the fabric down and centered the pallet on the top of the pads and fabric. We stretched the fabric up and over the bottom of the ottoman and tacked the fabric down using staples. It works best if you tack opposite sides to get the tension right without any puckers. ...tack the sides of the ottoman fabric to the pallet to give a little definition to your new piece! We used a hammer to set the tacks in hard. I love these kinds of low cost...recycle projects. There is something very rewarding about taking something that others consider junk and bringing it back to life. I LOVE this ottoman in my entry way so much I think I may make one for my family room!!! For more ideas on how to use pallets check out Designrulz 35 Creative Ways To Recycle Wooden Pallets. If you have any questions about this project, or any others, you can email me at tweetledeedesignco@gmail.com and I will be happy to help you out. Sometimes goodbyes and hellos all run together in tears of joy. 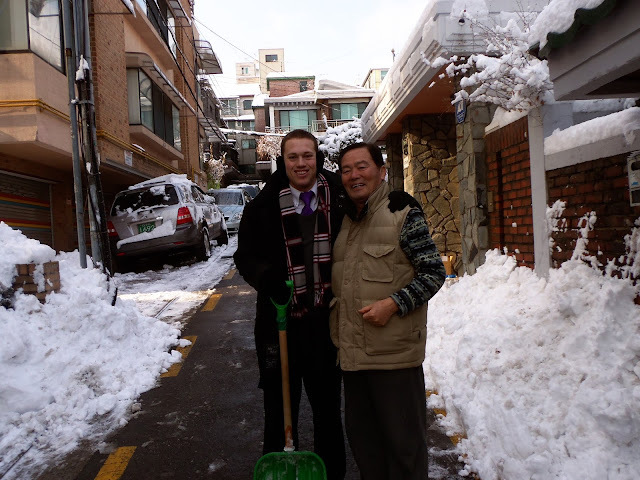 For the past two years our son Michael has been away in Korea serving a mission for The Church of Jesus Christ of Latter Day Saints. He returned last week to a joy filled ...teary eyed family, excited to see their big brother come home! It isn't easy having your son so far away, but the joy that comes from knowing your son is helping other people fills every bit of the emptiness of having him home. It is soooo wonderful to have our son back home...just to hear his voice in our home brings a smile to our faces. We love hearing about his adventures in Korea and am learning a few words in Korean too. Of course...typical of everything I do, the banner that was suppose to say "welcome home" was hung backwards and read "welcome emoh". We all had a good laugh about it...and figured he wouldn't notice after a year of reading Korean!!! Now to go pack to head to Washington and help our daughter welcome our newest grand daughter into the world and prepare a huge 20th birthday celebration for our "little Tina" who isn't so little anymore. It has been a busy few weeks...and will be even more so heading towards Easter...but there is nothing that I love more that being a mom and grand mom to these kiddos.